God is everywhere – I Am Not Ashamed Of The Gospel Of Christ! There is not a single place on the face of the earth any one of us could go and be out of the presence of the Lord(Psalm 139:7-12). 7 Whither shall I go from thy spirit? or whither shall I flee from thy presence?8 If I ascend up into heaven, thou art there: if I make my bed in hell, behold, thou art there.9 If I take the wings of the morning, and dwell in the uttermost parts of the sea;10 Even there shall thy hand lead me, and thy right hand shall hold me.11 If I say, Surely the darkness shall cover me; even the night shall be light about me.12 Yea, the darkness hideth not from thee; but the night shineth as the day: the darkness and the light are both alike to thee. 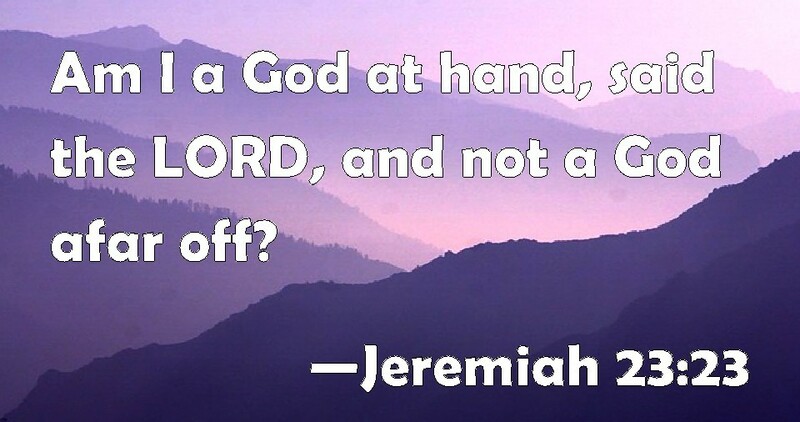 Jeremiah 23:23-24 23 Am I a God at hand, saith the Lord, and not a God afar off?24 Can any hide himself in secret places that I shall not see him? saith the Lord. Do not I fill heaven and earth? saith the Lord.